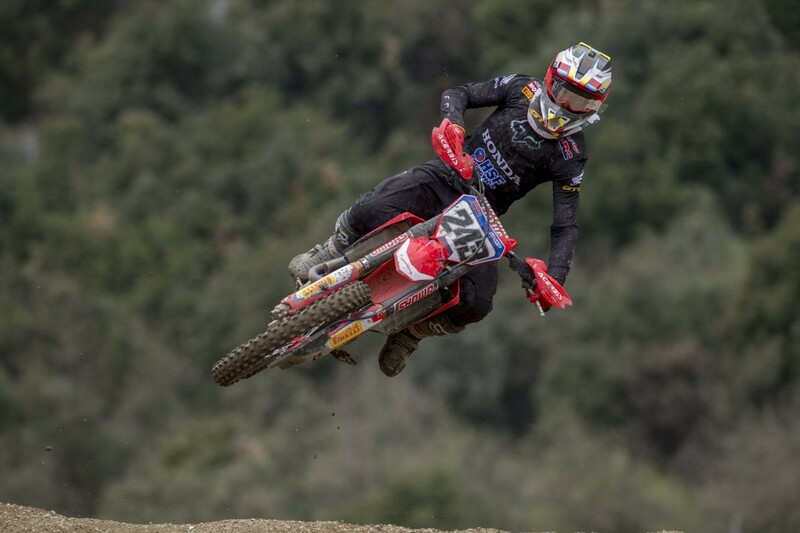 Red Bull KTM’s Antonio Cairoli and Honda HRC’s Tim Gajser served-up a classic for round four of 18 in 2019 MXGP and the first of three races to take place on Italian soil this year. After all the rain that had bashed arguably the most scenic MXGP circuit on the calendar in the build-up to round four of 18 (no longer 19 after the cancellation/postponement of the Grand Prix of Hong Kong until March of 2020) the storm nevertheless continued at the small, scratchy, and beautiful venue of Pietramurata, deep in the northern mountain range of Italy. The combination of elements such as noisy fan groups for Cairoli and Gajser (the Slovenian border is not too far away), two athletes pushing to the maximum on a slick and difficult track that invited the smallest mistake, the closeness of the speed, and the cat-and-mouse affair all weekend through the qualification heat and two motos meant the atmosphere matched the intensity of the on-track spectacle. Fantastic stuff. Here are some of the key sights and news on the third consecutive weekend for MXGP. Cross your fingers for Gajser. In the last three weeks, the 2016 World Champion has body checked the Matterley Basin soil, the Valkenswaard sand, and the Pietramurata rain-soaked hard-pack with the type of crash that could easily have scuppered his season. The 22-year-old endured an injury-hit 2017 and the vicious accident that led to a broken jaw in the 2018 pre-season effectively diluted his chances of finding the same momentum as the rampant Red Bull KTM’s. At the moment Tim is riding his luck but is also working-into some spectacular form. The Trentino Grand Prix was a fitting stage for his first MXGP victory of the year and to halt Cairoli’s spell of three successes on the bounce. It was the site of his first GP win back in 2015 and is a quasi-home race thanks to the growing gaggle of yellow-and-red decked supporters that make more of a din with flares, flags, and shouts than other full circuits on the Grand Prix slate. Gajser’s pace and growing stature is vital for the series. The #243 is the only rider to yet show a front wheel to a youthful 33-year-old Cairoli and the sole rival to deprive the Red Bull KTM man of a moto checkered flag thus far in 2019. Cairoli himself has dealt with a shoulder and neck issue that was causing arm-pump (and thus mistakes) in Matterley and Valkenswaard but Gajser had not able to ruffle the Sicilian any further due to his own faux pas. In Italy the duo served up two chases where they pursued, pressured, and studied the other around a course that was significantly rougher and more technical than previously dry editions of the event. The rain largely stayed away across the weekend but the natural dampening from the spring climate had already been a helpful assist. Starts were key and both hit their cues in this respect (witness the woes of Monster Energy Kawasaki’s Clement Desalle and Jeremy Van Horebeek, both buried in the pack and suffering with their own injury problems—Van Horebeek’s apparently from a second moto tumble) but the amount of precision and throttle-control on display was damn impressive and they both stretched free of the pack by a good 30 seconds in both chases. Gajser was the hunter in the first moto and deprived Cairoli of the checkered flag with minutes laps to go. The KTM man posted the best lap of the race on the final circulation in an attempt to fight back. In the second moto the roles were reversed, and Cairoli watched and then jabbed. The tension climbed as the proximity narrowed in the last stages and only a crash by the local hero allowed Gasjer a free flight with two laps to run and deflated the watching crowd that squeezed into most of the spectator zones. The unpredictability of the fare and the knowledge that both were skirting on the edge of disaster while being wilfully pushed on by the presence at the fences forged some powerful scenes. It was the sort of duel that, on paper, should happen more often but rarely does. Cairoli was visibly annoyed with the mistake in the second moto as well as the realisation that the chase of glory could have ended on the treatment table at a time when KTM are already missing their defending champion. He later posted an image on his Instagram of a large ice-pack on his left knee, the leg that crumpled under the 450 SX-F as he hit the trackside banking. Like Cairoli, Gajser has a perfect podium record in 2019 and has been 2-2-3-1 and has now reached 16 wins (only Cairoli, Herlings, and Desalle from the current crop have more in the premier class). Trentino was key from a morale point of view (remember that KTM only allowed all the other brands to have just one GP from 19 in 2018) but also numerical as he clipped six points away from his peer’s red plate margin and the gap is now a token 16. MX2 World Championship leader Rockstar Energy Husqvarna’s Thomas Kjer Olsen found out how even the tiniest misstep (mediocre starts and a first moto mistake) can be harshly judged against a threat of Jorge Prado’s type. The Dane was bumped from the podium ceremony for the first time in 2019 by a rampaging performance from Monster Energy Kemea Yamaha’s Ben Watson on the last lap of the second moto as the MX2 class ably supported the MXGP show with flurries of action and conflict that prevented the majority of the crowd from heading to the Panini food stands. Of course, at the front, it was a non-contest, much to Olsen’s despair. 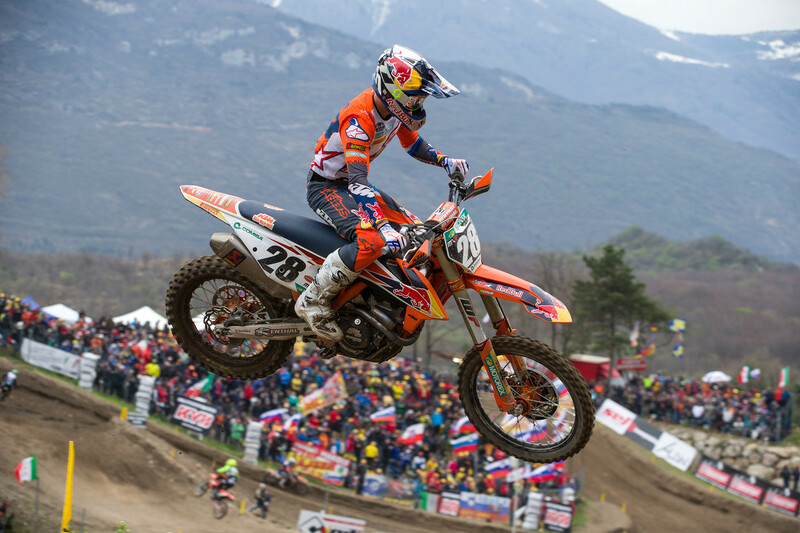 Prado won his first Grand Prix at Pietramurata in 2017 (he also excelled in EMX250 there) again in 2018 and his qualification heat triumph, and 1-1 completed the hat-trick both at the track, and in 2019. The Spaniard was first on every single entry on the lap chart in Italy and has yet to be demoted this year: nine motos, nine wins, and very little in the way of a challenge. Prado is maturing at a scary rate. There could be an argument as to the level of the competition with only Olsen and HRC’s Calvin Vlaanderen (now absent and under a surgeon’s knife after twisting his right ankle and breaking part of his fibula) boasting GP winning experience but MX2 is bubbling with younger riders skirting upwards on their career development. Names like Monster Energy Kemea Yamaha’s Jago Geerts (a second successive podium result here), R&H Racing Team’s Henry Jacobi, Watson, and Honda 111 Motorsports’ Mitch Evans should not be underestimated. And, for Prado, there is the now-customary adversary from within the KTM awning. If 18-year-old diminutive rookie Tom Vialle still lacks the conditioning and racecraft to strongly close each moto—much like Prado himself in his rookie term in 2017—then he certainly apes his Spanish teammate for starting prowess and one-lap speed. The quiet and unassuming (but seemingly fiercely focussed) Frenchman was afforded a second podium walk in just four GP outings thanks to Watson’s diligence on the final lap. Worryingly for the MX2 field it looks like the best of Prado is still to come. Whether there was some gamesmanship to his words after the Grand Prix it did not make for easy listening. There has to be a degree of truth to Prado’s assertion. He has barely ridden the KTM since the left shoulder problem that caused him to miss the British Grand Prix three weeks ago and while Trentino had all the marks of a “training day” then it’s hard to believe he is yet 100 percent physically or in terms of form. The situation and the strength of his performances only increase his aura. Without a hint of arrogance, he admitted: “I think Olsen can see I am coming and that won’t be easy.” The gap in the championship is now down to 20 points. The date change for the Grand Prix of China, which now ends the championship two weeks before the Motocross of Nations at Assen in the Netherlands, opened a large scheduling hole for MXGP with four weekends of respite before the paddock again gathers in Italy for the Grand Prix of Lombardia in the sand of Mantova in May. After three races in a row it is a radical short-shift for the series but permits a valuable breather. Athletes like Desalle will use the time to fix his left hand and knee, Monster Energy Yamaha’s Romain Febvre will get fitter with his broken ankle while the looming comeback of Jeffrey Herlings edges even closer. Expect the Dutchman to be back on the KTM in the next two weeks and, depending on his rate of recovery, Mantova might see the #84 back behind the gate. 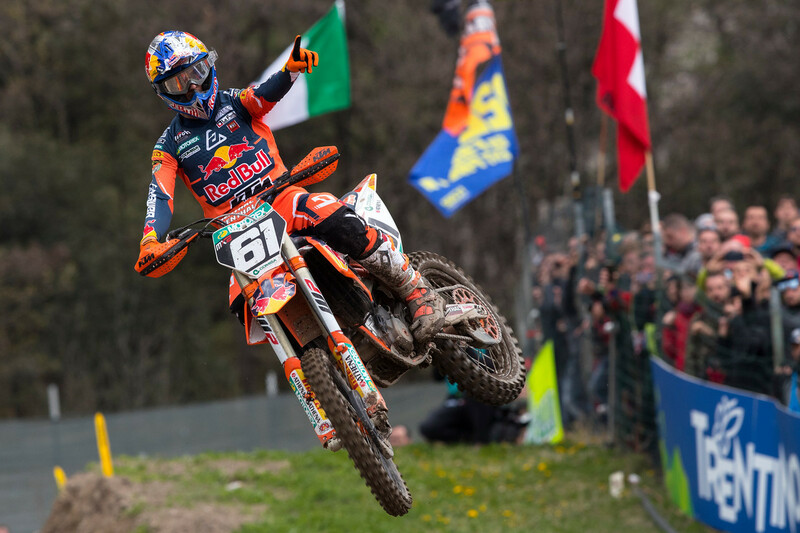 It would be fitting: Herlings pushed to win his first ever GP moto as a 15-year-old in the Italian sand in 2010 and celebrated his first podium that same day. For others, the rest of April means another glance at the drawing board. Monster Energy Wilvo Yamaha’s Gautier Paulin might have been pleased with his second podium of the year but the deficit of 30 seconds to the leaders is a daunting chasm. Again in his post-race comments Paulin, intimated that set-up with the YZ450F remains a priority. Teammate Arnaud Tonus returned to the top five of the class and on a circuit the Swiss clearly relishes: the oft-injury hit rider gained his first MXGP trophy there in 2017 and this set of results was his best since he claimed a moto on home soil back in the summer of that same year. The satellite Standing Construct KTM team will be another squad circulating the Benelux tracks or considering Dutch domestic races. Max Anstie crashed and tweaked his knee in the first moto and Glenn Coldenhoff still needs racing laps after his pre-season vertebrae injury. Interestingly it was the team’s third rider, Ivo Monticelli that excelled in Italy with his fifth position representing a career-best. On the American front, Bike it DRT Kawasaki’s Darian Sanayei’s luck is not improving: a mechanical problem in the first moto and a first corner crash in the second moto were just some of his woes over the weekend. The former EMX250 race winner will also relish the GP hiatus to further recover from his case of Epstein-Barr. Bud Racing Kawasaki’s Mitchell Harrison, who recently came to Europe from Monster Energy AMA Supercross, caught the eye with some quick laps but this was also a testing appearance on a quintessential “old-school” Euro-style track and some of the quicker and wider layouts will probably best suit the youngster. After finishing fifth in qualifying on Saturday, he went 22-17 for 19th overall on Sunday.